China’s media, directed by its government, used the simultaneous visits by Israeli Prime Minister Benjamin Netanyahu and Palestinian Authority President Mahmoud Abbas this week to highlight the country’s ostensibly growing role in the Middle East – in accordance with the effort by its new leaders to expand China’s profile in the international arena. The government’s handling of the visits, meanwhile, signaled Beijing’s desire to be seen by both parties as a fair-minded player, with Netanyahu the recipient of a few subtle bonuses. As the world’s second-largest economy and the largest crude oil importer from the Middle East, China naturally has vital interests in the region, but traditionally it has been reluctant in seeking the spotlight. In recent years however, with its economic rise and its growing global trade footprint, that reticence is changing. The fact that the US has begun shifting its focus on Asia and downsizing its presence in the Middle East has also created space for China to enter. China understands that in order to play a weightier role it needs to have Israel’s ear, but it also wants to maintain its close ties with the Arab countries. With both Netanyahu and Abbas ready to visit, the hosts found a typically Chinese polite solution that served their desire for increased influence: invite both leaders, at short notice, to come at almost the same time — Abbas from May 5-7, Netanyahu from May 6-10; kindly offer to arrange a meeting between them should they wish to hold one (a first such gesture by China); but make sure they won’t have to meet if they don’t (Netanyahu arriving in Beijing from Shanghai after Abbas has already left town). As true masters of ceremony, Beijing did not leave anything to chance. China made sure Abbas arrived first, underlining its support for the Palestinian cause, but granted Netanyahu more “face time” with key figures, and highlighted China’s wish to deepen ties with Israel through actual cooperation in areas such as economy and technology. In his meeting with Abbas, President Xi Jinping proposed a four-point plan to settle the Palestinian issue, including endorsing the “just cause” of the Palestinians, support for a two-state solution, a demand to halt settlements, and backing the land-for-peace formula. However, seeking to assert its credentials as an honest broker, Xi also made a gesture to Israel by noting “Israel’s right to exist and [that] its legitimate security concerns should also be fully respected,” mirroring the formulations used by American officials. The Chinese media, owned and controlled by the government, follows a tight script for such high-profile visits; every detail, including photo opportunities — and the subsequent use of the photos — is choreographed to express China’s position. Both Xi and Premier Li Keqiang in turn received Abbas and Netanyahu at the Great Hall of the People and with full military guard. But the article by Xinhua, China’s official news agency, included several photos of a visibly relaxed, smiling Li welcoming Netanyahu — China’s other state news agency, China News Service, ran a whole series of photos — whereas the Xinhua story covering Li’s meeting with Abbas limited itself to two relatively toned down photos. Nor was the symbolism limited to photo ops. While Abbas gave an interview to China Radio International, Netanyahu was invited to hold a live chat with Chinese netizens on Xinhua’s website, and gave a speech at the Central Party School, the main academic institution that trains the Communist Party’s future leaders. Not every foreign leader is invited to speak at the school. Indeed, Netanyahu is only the second leader this year to speak there, after Prime Minister of Singapore Lee Hsien Loong. These are not minor niceties. When Iranian President Mahmoud Ahmadinejad in June last year attended the annual economic summit of the Shanghai Cooperation Organization in Beijing, the protocol-conscious Chinese didn’t invite him to hold a press conference while in the capital. When he talked to students at Peking University, he read from a prepared statement, and was not allowed to take questions. 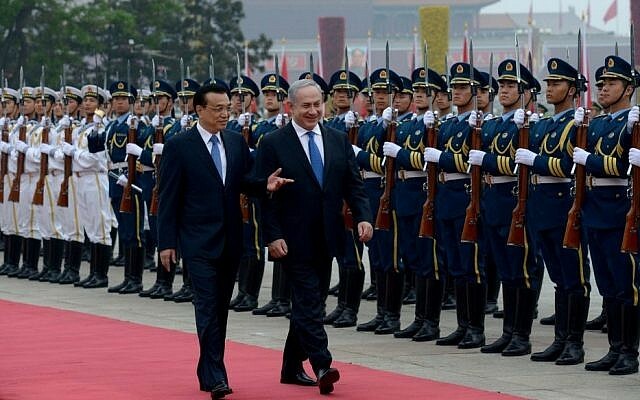 Netanyahu came to China directly after reported strikes by Israel against Syrian military sites holding missiles en route from Iran to Hezbollah. In order not to spoil the visit, Chinese spokeswoman Hua Chunying expressed restrained criticism of the strikes without naming Israel, arguing that any country’s sovereignty needs to be respected. 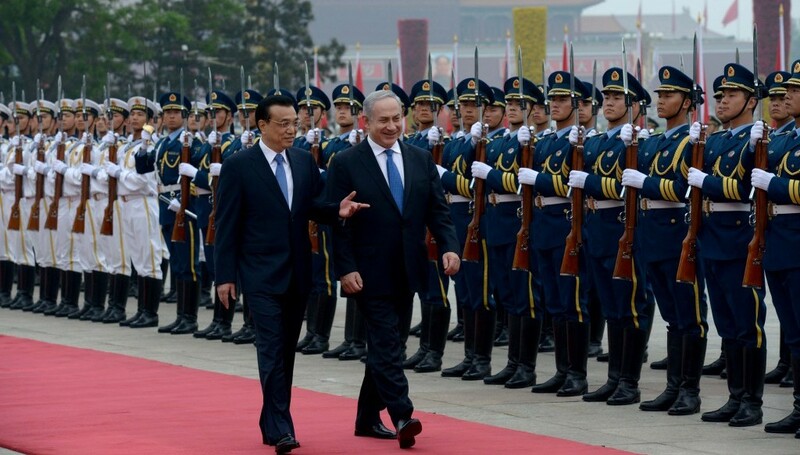 But Xi and Li didn’t mince words in their respective meetings with Netanyahu. Both leaders repeatedly stressed the need to “create the conditions” to restart negotiations with the Palestinians and said that solving the Israeli-Palestinian conflict holds the key for peace for the entire region. The Chinese media dutifully highlighted what it called China’s objective position on the Middle East and praised its more proactive diplomatic stance. But it’s an open question as to what role, if any, China will actually play. For now, it has signaled an intention to get more involved at some stage. Its hosting of the two simultaneous Abbas and Netanyahu visits marked a fairly deft first step.